Angon - It was an Anglo Saxon throwing spear of the dark ages. It had a long slender iron neck and a barbed head. It was similar to Roman Pilum. Axe - It was one of the first toolsdeveloped by the humans. It was a blade attached at one end of the pole. It could be single or double headed and one or two handed. Bill - It is a pole arm with a wide cutting blade that may be with or without spikes and hooks. It was probably a common agricultural tool modified for wars. Bill hook was used by the English infantry. They could kill an armored soldier or even the horse. Catapult - Similar to common catapults, they were designed to throw spears and heavy bolts. Coronel/Cronel - They were the crown-shaped lance head used for peace or tournament encounters. Flail - It is a pole arm that has a spiked or knobbed steel ball or a bludgeon joined to a haft with a chain. It could be one handed or two handed. At times there were two balls attached to the same haft with two chains. Francisca - It was a light throwing axe used by the Franks along with the angon. Gisarme - It can be called a massive spear of 15th century. Glaive - It was a broad blade single edged pole arm mounted on a 7' pole. The shape of the blade was similar to a butcher knife. Godendag - They were the broad-bladed halberds used by the Flemings. Hache - though the term is generally used for Bec de Faucon or poleaxe, it was not an axe. There appear to be two types of axe. One had an axe blade on the front with a hannerhead or a spike on the other side. The other was a hammerhead with a spike instead of an axe. Haft - It was the wooden pole of a pole arm on which the blade or hammer etc. were attached. Halberd - It was a broad but short axe blade on a 5' to 6' long pole. It was generally combimed with a back-spike or spear. It could combat heavy armor. Hammer - Despite being called hammer, it appeared more like a pick. It was effective against the plate armor and used in 15th century. 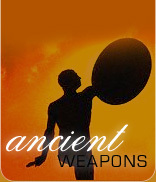 Lance - A lance originated as a long spear and gradually gained length and become one of the favored weapon. Langet - The were the metal strips attached to the shaft of the pole arm to protect the weak joint between the haft and the blade. Longbow - It was the archers weapon developed in Europe. It was one of the favorites of the English during and after 14th century. It was used in combination with dismounted cavalry and infantry. Its range could be as much as 300 yards. It was ineffective only against a plate armor. Mace - One of the oldest weapons that evolved from the stone topped club. The medieval mace had a metal ball atop the haft that could be spiked. It could counter any armor with the heavy blows. It always was a symbol of power and rulership. Partisan - another guisarme-type of polearm, this variant had a broad, sword-like blade ranging from 2 - 2 1/2 feet in length. This blade was double-edged and had lugs of various designs at the bottom. Pike - It was a long infantry spear used in formation. It could be 18' to 23' long. Pilum - It was a leaf bladed Roman throwing spear, attached to the wooden shaft. The Franks and Saxons adopted it at the angon. Quarterstaff - It was a long stout pole for self defense. Its length was customized to the user and was from toe to the up stretched finger of the up stretched hand. Ot was named so because the staff was held at the quarter length by the first hand an middle by the second. Spear - It is a long shafted pointer weapon that evolved at the same time as the club perhaps. It is used for thrusting and slashing. with the club, perhaps the first human tool designed specifically as a weapon, the spear is simply a long-shafted weapon designed principally for thrusting, although many spears were also capable of slashing blows. Volgue - It is an archaic term for a spear, which probably came to be synonymous with a glaive.